Canucks defenseman Alex Edler has been part of trade speculation for several years now but nothing has come of it. Now, the Swedish blueliner is in the final year of his contract and accordingly, he has been scouted quite frequently in the early going this season, Sportsnet’s Elliotte Friedman reported in an appearance on Sportsnet 650 (audio link). While Vancouver is off to a good start this season, the expectation is that they’ll eventually become sellers and Edler would likely be at the forefront of those efforts. He’s off to a solid start with five points through nine games while leading the team in playing time at 24:28 per contest and would be a top-four upgrade for many contending teams. However, the 32-year-old has a full no-trade clause so he would have the ability to control where he ultimately winds up. In an appearance on Insider Trading (video link), TSN’s Darren Dreger noted that Kings defenseman Alec Martinez has come up in trade speculation lately. Los Angeles has not gotten off to a particularly strong start this season which has led to an expectation that a move involving a notable player or head coach John Stevens will be made. Martinez would certainly draw considerable interest around the league as a top-four player that can play the right side with a team-friendly cap hit of $4MM through the 2020-21 season. Through nine games this season, the 31-year-old has a pair of assists while logging 21:28 per night of ice time. Coyotes defenseman Jakob Chychrun has been cleared for contact, reports Craig Morgan of The Athletic (Twitter link). He has missed the entire season thus far as he works his way back from surgery to repair a torn ACL. GM John Chayka had previously indicated that once Chychrun got this green light, he’d be about two weeks away from being declared as ready to play. The Arizona Coyotes are hoping to make a run for the playoffs this season after an inspiring second half and several changes this summer. The team brought in Vinnie Hinostroza, Jordan Oesterle, Alex Galchenyuk and Michael Grabner, while retaining almost all of their key players—save for Max Domi, who was sent to Montreal. In order to really push for the postseason though they’ll need to stay healthy all season, and there was some more good news on that front today. Jakob Chychrun, who underwent his second knee surgery in a year back in April, has been cleared to skate according GM John Chayka who relayed the information to Craig Morgan of AZ Sports. Chychrun is just 17 weeks out from the procedure, and is expected to be a full participant in training camp. That’s huge news for the Coyotes but also is extremely important for Chychrun, who is heading into the final season of his entry-level contract without an injury-free season under his belt. The 20-year old defenseman has played just 68 and 50 games in his first two seasons, limited by two major knee injuries already. While he’s been impressive in his ability to recover from surgery, he needs to prove that he can stay on the ice for an entire season before the team commits to him going forward. He’s shown an ability to log top-four minutes in the NHL even as a teenager, and now must start to fulfill his extremely high potential and dominate the league. 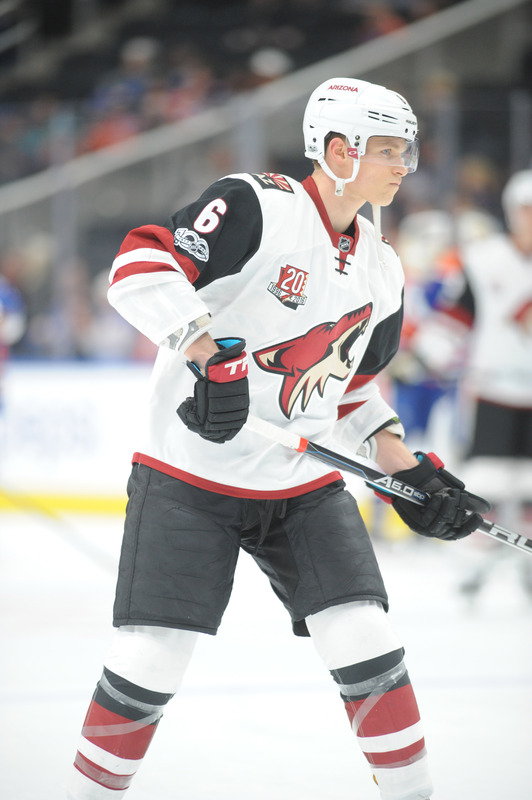 Chychrun dropped to 16th overall during the 2016 draft, but many felt that was due to overexposure and perhaps some disinterest during his final year of junior hockey. He had long been projected as a potential top pick given his obvious talent at both ends of the rink, but saw Olli Juolevi, Mikhail Sergachev, Jake Bean and Charlie McAvoy all go off the board ahead of him on draft day. He’s played more NHL games than any of them—in fact Juolevi and Bean are still waiting to make their debuts—but hasn’t quite shown his full potential in Arizona. With Oliver Ekman-Larsson signed to a huge extension, Chychrun could provide the Coyotes with a rock solid second option on the left side for many years to come.